GDP Growth Rate and Business Investment data has been published in the UK and the US will publish Durable Goods Orders, Personal Income and Spending data. 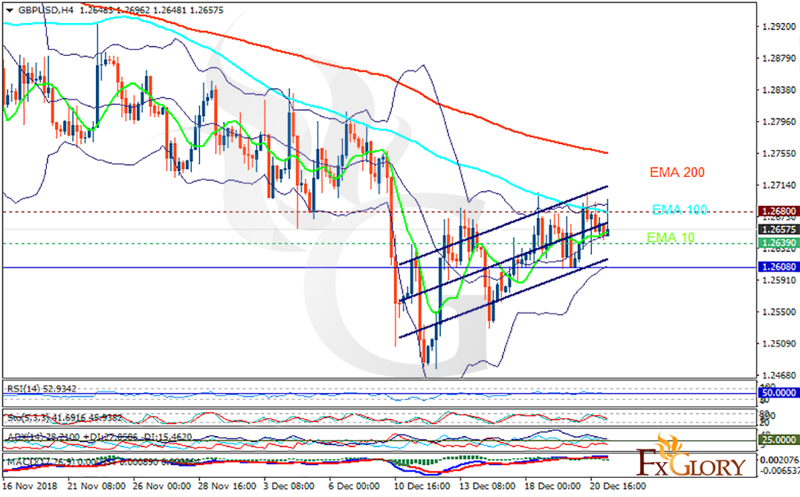 The support rests at 1.26390 with resistance at 1.26800 which both lines are above the weekly pivot point at 1.26080. The EMA of 10 is moving with bullish bias in the ascendant channel and it is below the EMA of 100 and the EMA of 200. The RSI is moving on the 50 level, the Stochastic is showing downward momentum and the MACD line is above the signal line in the positive territory. The ADX is showing buy signal. The indicators are showing mixed signals therefore GBPUSD might be fluctuating within the lower and upper Bollinger bands.